Amber has been documented for approximately 13,000 years. Baltic amber is known as the finest in the World. Therapeutic, it eases pain, is rejuvenating, a vitality booster, protects against illness/disease. We are amber & jet specialists and suppliers of quality ambers and jet as cabochons of all sizes calibrated and hand cut. Beads of all sizes, rare specimens of white and butterscotch amber. We have unusual copal and blue ambers. We also supply cherry, lemon and green amber. We have cut and uncut - polished and unpolished amber and jet. Silver set amber and jet jewellery, and teething necklaces, drilled pendants and lumps for you to make your own pieces. You can find our shop in ebay shops under 'amber-stuff' - see below for the address. 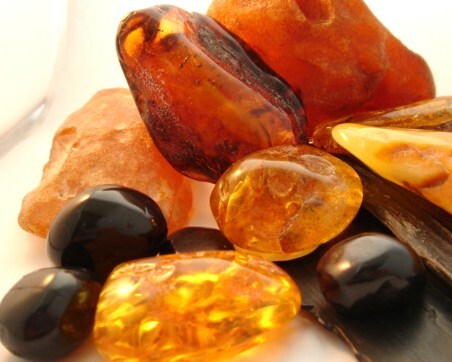 Ancient fossilized Baltic amber contains the highest concentration of Succinic acid a powerful antioxidant that help fight toxic free radicals. Stimulates neural system recovery. Bolsters the immune system. Boosts awareness, concentration, and reflexes. Worn against the skin it warms and releases therapeutic properties safely and naturally.